Today I got to put on a shirt and apron at a restaurant and make jam. Doesn’t sound all that thrilling, but for a wannabe it was SO. THRILLING. As my sister’s friend Jeff would say, I looked very profesh. Here’s the back story: my husband has a cousin who lives in Oakland and runs a lovely little restaurant in the heart of Berkeley. 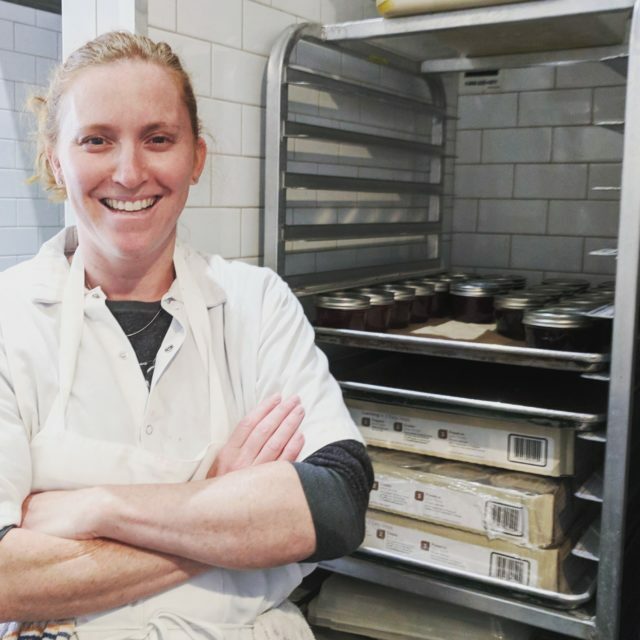 She is a trained pastry chef and worked at the famed Chez Panisse. Her husband was an executive chef at restaurants in downtown San Francisco. Together they started Summer Kitchen and Bake Shop. The food is locally sourced and prepared fresh daily. Soups, salads, pizzas, sandwiches–all delicious. We were visiting a couple of weeks ago and I was talking about how great it is to live so close to where the produce is grown all year round; especially fruit! 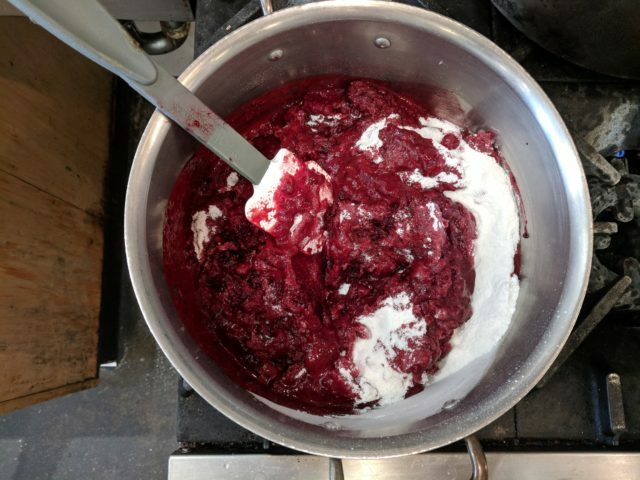 I told them I had made a batch of strawberry jam, which I love to give as gifts to good friends and the kids’ teachers. They said they would love to be able to sell jam to their customers so I pounced at the chance to make some for them. The issue, of course, is that I don’t have a commercial kitchen, nor a cottage industry license (which you can get here) and I also can’t work, being a resident alien. 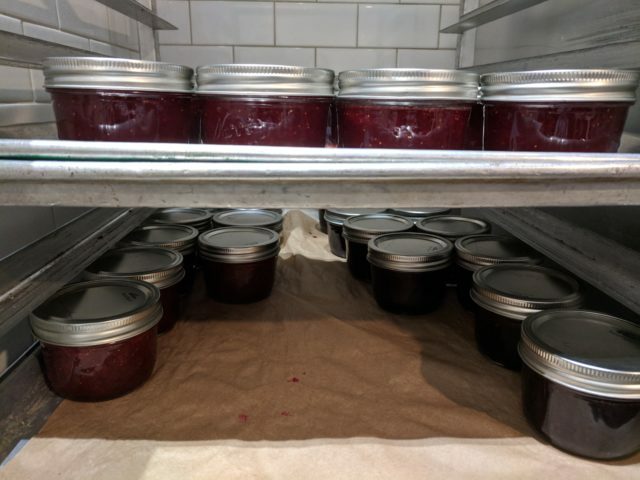 My cousin said I was welcome to come up to the restaurant any time and make some jam with her. So I did! I brought two kinds of berries: the traditional strawberry, which is a crowd favourite, and the olallieberry. “The olalliewhat?” you say? The olallieberry is a cross between a Logan berry and a Young berry. They look similar to blackberries, but they aren’t as big and they are slightly sweeter, closer to that of a raspberry. The hybrid was officially named and released in 1950. They have a short season and are only available for a couple of weeks in June. I got an early batch from Gizdich Ranch down in Watsonville. If you ever wondered where your berries come from in the dead of winter (hello, Canada, I’m talking to YOU), then wonder no more: they come from Watsonville, California where fields of berries stretch beyond what the eye can see. I made one batch of jam with Quickset, my favourite sugar/pectin mix from Redpath, but it was the only bag I still had from Canada. 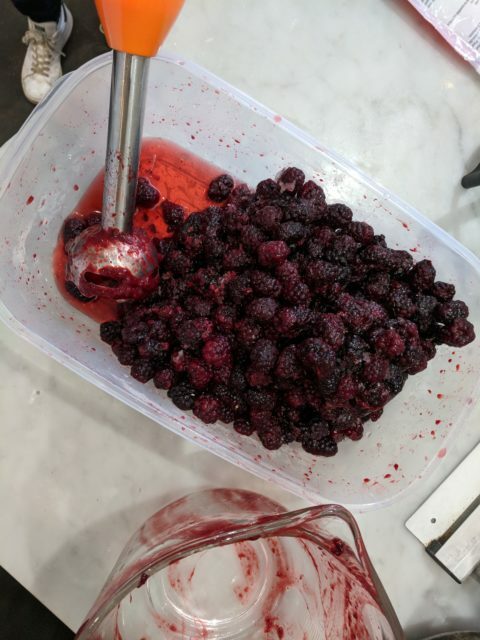 So we made our own version coming up with a good ratio of fruit to sugar and pectin for the remaining batches and I think the jam set quite nicely…I’m testing out a jar of olallieberry jam tomorrow morning (okay, maybe tonight) to see how the sugar/pectin mix worked with the fruit. If it works then I have a new formula and recipe for my jam since the old formula involved shipping the sugar/pectin mix from Canada, which is not exactly cost effective. I’m going to think of other combinations to mix with the fruit since it seems to be quite trendy (balsamic this, and pepper that). I’m a fairly simple girl when it comes to jam. I like to slather the jam on a slice of fresh baked bread or crunchy toast. Either way, the jam makes it taste that much better. I’ve become one of those purveyors of “small batch, locally sourced, homemade [fill-in-the-blank-here]” but I don’t mind. In fact, I quite like it! Who knows? Maybe this could be the start of something really sweet. Until today the only canning I had done was making jam. As of today I can add pickling to my repertoire. On a whim I bought a batch of mini pickling cucumbers. I knew time was working against me so while the baby was napping this morning I got to work. 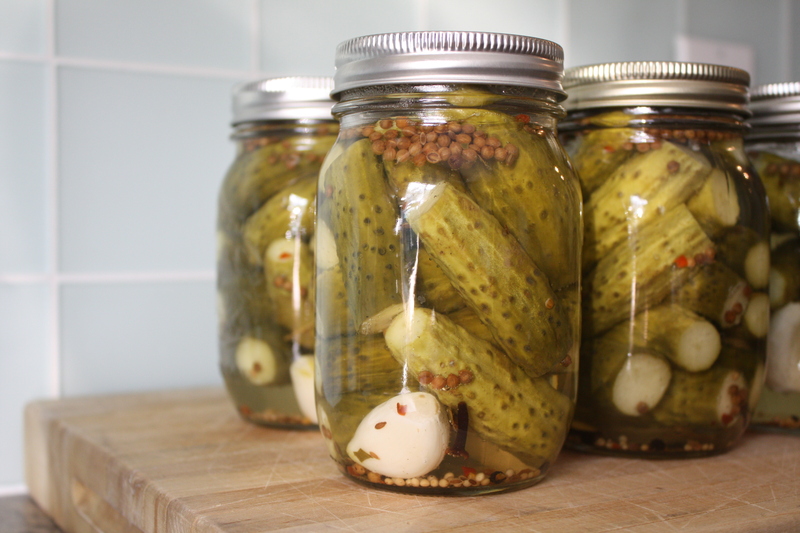 Sterilizing, boiling, brining, cutting, pouring, processing and voila, pickles!!!! I found the recipe on a fabulous site called Food In Jars, which was fairly simple to follow. The only deviation was the pickling spices. Rather than make my own I bought a pickling spice mix at the grocers–much easier and less time consuming. Oh yes, and I didn’t have cider vinegar so I went with straight white vinegar. Now comes the hard part: waiting. The recipe says they can be stored in a cool, dry place for up to a year but it doesn’t say when I can dig into them….maybe 3 months? 3 weeks? 3 days? 3 minutes? I’m not sure I can wait!! !